NEW YORK (CBS NewYork) – For the second time in two weeks, a piece of debris has fallen from an elevated subway and crashed down on a vehicle below. The car was occupied and in motion at the time of the incident, according to Councilman Jimmy Van Bramer. Apparently what struck the vehicle was a rusted piece of metal – possibly a piece of metal from a staircase that goes over the street. The MTA said they were looking into the incident. It’s the second time something’s fallen from the station in two weeks. On Feb. 21, a wooden plank from the elevated 7 train platform came crashing down on a car driven near 65th and Roosevelt Avenue. The plank pierced the windshield, landing just inches from the driver. 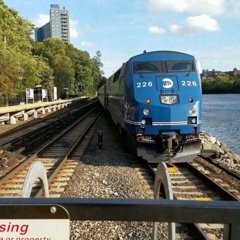 The MTA launched an investigation into the incident and announced that every inch of elevated track – 188 miles in three boroughs – would be inspected. Just a few days ago I observed a hole on one of the Woodside 61 st platforms and I told myself "I hope a fat person dosen't stand here. We don't need another piece of the to break again." How long till they start thinking of replacing the els like the air train els? Progress will get done when management gets better, until then, this. A long time. Even with management changes and whatnot. It'd be a very intense project to completely rebuild century-old els from the ground up, and a line like the has a lot of daily riders – who surely would not take kindly to massive service disruptions and cuts while the structure was rebuilt. Unless you somehow managed to build the el above the current one – or bury the line (which also likely wouldn't happen) I see no replacement happening. Rather, better maintenance and rehabilitation of existing structures is the way to go. Exactly. We're looking at this from the wrong angle. Even discounting the extreme costs to rebuild and/or bury the existing elevated lines, they themselves are not the issue here. The problem here is that pieces of the structures are flaking off like dead skin, but unlike dead skin, these rotting pieces of wood, steel and metal are quite dangerous when they fall to the ground, the last two incidents involving such a scenario have proven quite soundly. No. What needs to be done is that the MTA must secure their infrastructure and prevent such incidents from happening in the first place. Whether that involves walking the length of every elevated track both above and below the structures remains to be seen, but they cannot continue to treat this as a one-off occurrence and simply ignore it. How hard would it be for the MTA to install netting underneath the els? It'd be likely extremely easy. I'd rather they didn't though because knowing the MTA, they'd install some opaque netting not unlike what they use when they're painting the elevated structures. That netting would stick around forever, gathering all types of dust and grime from the trains above and the cars below and look terrible after about a week. Also, it doesn't fix the problem at hand, but rather just masks it with another. Besides, they'd still have to collect the debris caught in the netting after a while. Otherwise, the netting along with the dangerous debris is going to come down onto the roads below. Replace the els with concrete viaducts that reduce noise and vibrations, and require fewer stanchions. Dual Contracts showed Els can be modified without service disruption, Jamaica/Mytle Els. LIRR Atlantic Ave Viaduct was 99% replaced in late 2000s with new welded cast steel structure instead of the old rolled steel and rivetted structure from the 1st grade separation attempt. I think it was 6 months of weekend closures to replace the LIRR El.